Dale Pruitt founder of C&E Sales, Inc. got started in the vacuum industry by selling Filter Queen Vacuums in college. In 1973 Dale opened his first store in Hurst "Progress Vacuum". In 1992 Dale and his Wife Jamie purchased a store in Grapevine TX. "Grapevine Vacuum". In 2008 Dale and Jamie's Son-in-law Andy started working for the company, and soon became manager of the Grapevine location. In 2010 both stores were renamed Lone Star Vacuum to help with branding. Seeing a need for the rapidly growing area of Frisco, Plano, Allen, McKinney, and The Colony, Andy and Dale decided to open a new store in Plano to service this area. In September 2015 They opened the store located at HWY 121 and Coit Rd. 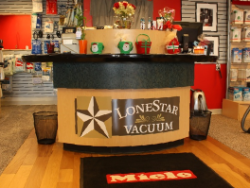 Lone Star Vacuum carries many well-known name brands including Miele, Sebo, Simplicity and dyson. With a business mission to get their customers the best vacuum for the best price, Lone Star Vacuum will not sell the "disposable/discount" vacuums just to make a quick dollar. They make every effort to provide their customers with the vacuum that has the correct features for their needs; and is in the price range they wish to pay. They service and provide warranty repair for every vacuum they sell. At Lone Star Vacuum their product experts will take time and care to help you find the best products for your lifestyle and maintaining a clean and healthy home. We offer full service, repairs, parts in stock and the entire line of leading brand vacuums for home and business to our loyal customers in the communities of Southlake, Flower Mound, Trophy Club, Roanoke, Keller, Westlake, Denton, Colleyville, Irving, Hurst, Bedford, North Richland Hills, Carrollton, Lewisville, Highland Village, Arlington, and Coppell here in Texas. Come visit us at any of our three locations in Hurst, Plano, and Grapevine to demo a new vacuum!